If you’re looking for a hike near Tokyo with stunning views of Mt. Fuji than Mt. Mitsutoge 三ッ峠山 is a great starting point. Mitsutoge is the generic name for a group of mountains including Mt. Kaiun 開運山, Mt. Osutaka 御巣鷹山 and Mt. Kenashi 木無山. The hike begins at Mitsutoge Station on the Fujikyuko Line around 2 hours travel from downtown Tokyo. While closer approaches are possible, they require either a car or bus connections. I recommend making as early start as possible as the hike itself can take up to 7 hours with an elevation change of just under 1,200 metres. Also pack enough supplies as the food options around the station are scant. After exiting the ticket gate turn left and left again, head under the railway line and follow the road past the Mitsutoge Green Center 三ッ峠グリーンセンター sports area. The route to the trailhead is signposted in both English and Japanese. The paved road passes the Yamazumi Shrine, a parking area and some waterfalls as it shadows the river. An hour of road side walking brings you to the trail proper near a small pedestrian bridge. The climb to the summit of Mt. Kaiun (1785m) which marks the highest point of Mitsutoge takes about 2 hours. The first landmark to note is the Darumaishi 達磨石 and after 75 minutes of solid hiking you’ll arrive at the ’88 Jizo statutes’ adorned with red bibs. Apparently, the true number has whittled down to some 81 at last count. The trail for the most part is in excellent condition apart from a little landslide damage where it cuts around the mountain side. Nearer to the summit there is a popular rock-climbing wall. The trail pops out at the Shiki Rauen-sansou one of two that rest on the ridge below the summit. Note that camping is not permitted. From here it’s a 10-minute hike up to the easily identifiable Mt. Kaiun with its ghastly broadcast antennas. If you’re lucky you can enjoy a wonderful panorama including Fuji san, Minami Alps, Yatsugatake and Mt. Tanzawa. On this occasion the big fella showed up momentarily before disappearing for good behind a curtain of mist and cloud. The best time to visit is during the winter with blue skies and clear distant views. When you’re ready to head off retrace your steps back to the mountain huts where the hike makes a long and gradual descent along the ridgeline. A good spot to take lunch is the far side of Mitsutoge-sansou where there are some benches. The ridgeline path is well-trodden and easy to follow and is about 2.5 hours hike time. After passing under some high-tension power lines views open up of Lake Kawaguchiko below. The trail passes over Mt. Arakura 新倉山 and Mt. Tenjo 天上山 before arriving at the renamed (2018) Mt. Fuji Panoramic Ropeway 富士山パノラマロープウェイ. Expect to be greeted with huge swathes of day-trippers at this popular observation platform. Options include continuing down to the lake or riding the ropeway (3 mins, 450 yen). From the lake it’s a 10-minute walk back to Kawaguchiko Station. I absolutely LOVED this hike. Thank you so much for all of your hard work and instruction. 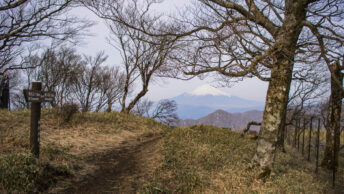 When doing this hike, I highly recommend Saruya Hostel in Shimoyoshida. Thanks for reading and glad to hear that you enjoyed the hike. I’m guessing there wasn’t much in the way of snow!? Hopefully you also timed it with some fine views. Hi there! Currently planning to do the hike as well. Was also wondering how were the conditions at higher elevations, in terms of snow or ice? PS. Many thanks to the post author for the nice overview and great photos! To check out the most recent trail conditions search the mountain name i.e. 三ッ峠山 with ヤマレコ (an online community for mountain climbing). Based on the most recent trail write-up from a couple of days ago there is nothing in the way of snow. Having said that there’s still likely to be ice around and I would suggest carrying some 4 point crampons or microspikes to be on the safe side. It’s was certainly cold. So bring a bag with enough gear to stay very warm. As you hike you will be hot and want to take something of, so be prepared for freezing temps as well as warm. Essentially, layers!!! Regarding snow and ice, just bring the right shoes so you don’t slip. There are not many spots to worry about at all. Completely safe. No spikes or anything required. Thank you for the great comments! Will take the crampons with as suggested by David Lowe to be on the safe side suitable layers as suggested by David Cortez. Will do the hike next week and give some feedback afterwards as well. Many cheers again!